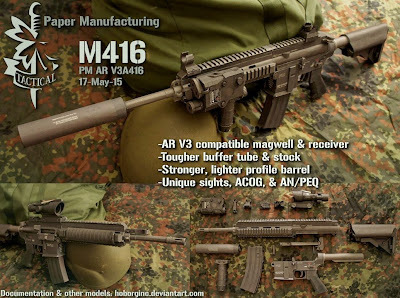 A realistic 1:1 scale papercraft of the HK416 assault rifle/carbine by Heckler & Koch. The model consists of several distinct parts that can be disassembled, and includes a collapsible stock and moveable bolt carrier. In addition to the rifle, some accessories like a foregrip, various ironsights, an ACOG optic, and an AN/PEQ-15 laser/IR module are also included.